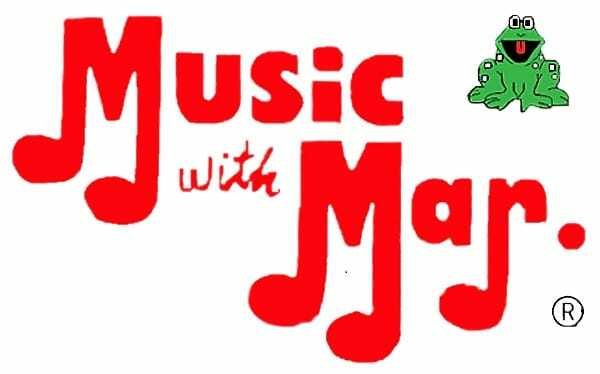 An interactive class for ages 8 months to 5 years where adults and children participate together in music and movement activities to enhance all developmental skill areas! Teacher Pam Tirado. Buy Tickets: Contact Instructor, Miss Pam - Email or 727-644-7605. 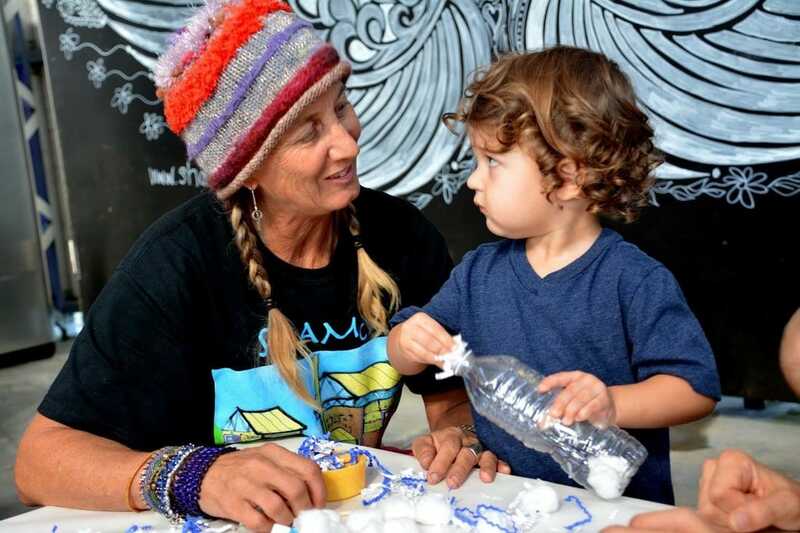 Join us for whimsical whimzey art projects! To purchase tickets please click the link of the class date you would like to participate in. Cost: Free - Love offering! Natty Moss Bond is a yoga teacher, rock and roll singer, artist, and secretary… She has been teaching yoga for several years and although she was trained in Classical Hatha Yoga her classes are different than your typical session, filled with plenty of laughter and loud music. She works with all ages, all body types, all kinds of music lovers and all levels of expertise. Tranquility, flexibility and deep belly laughs are typical results of Nattyoga. There is no guarantee that you will get better at yoga, but you certainly will leave the class with a smile on your face. Instant Glam! Give yourself a show stopping hat or give one for a special occasions. Add a wow factor to your own head or for upcoming birthdays, anniversaries, retirement, showers, weddings or reunions. For gifts, you can add your own pics and we will provide the lettering (happy birthday, etc..). 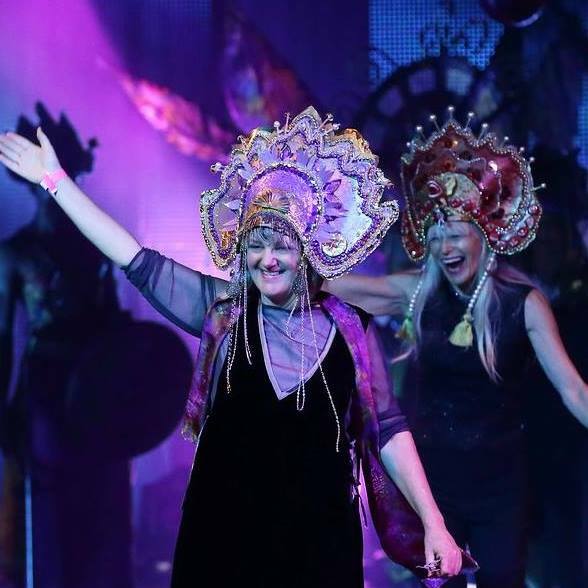 The headdress are made to adjust to any size. What we will provide - The plastic custom cut hat base, glue and all the do-dads. The base hats will be silver or gold and you will add the color. What you should bring- Scissors and a glue gun. We have a few extra glue guns if you don’t have one. Do-dads from you own collection if you have them. Janee’ Scarle of Old City Calligraphy offers “Cocktails + Calligraphy” which focuses on the Introduction to Modern Calligraphy for Beginners; no experience is necessary! Over the course you will learn the detailed techniques of pointed pen, one-on-one attention/correction of technique, how to get started, and have useful information for when the class is over. We provide the starter kit (a goody box) filled with all of the tools needed to get started (and some of our secrets): a jar of ink • a selection of nibs (2) • a pen holder • various types of paper • guidelines and instructions to help you after the class • surprises! Create a mask for indoors or out from a material readily found in Florida, part of the bark of a palm tree! We will become inspired by world cultures and paint and embellish this natural form to be displayed indoors or out. The instructor will bring masks that she has created, and reference materials, to get your creative juices flowing! Instructor will provide palm bark, paint and brushes and some embellishments. Artists bring embellishments they would like to include. 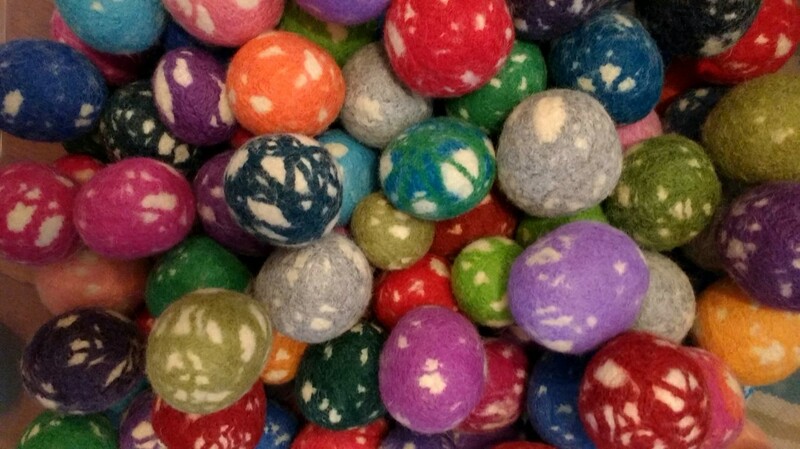 Learn to felt wool by making colorful felt balls! You will learn the fundamentals of wet felting technique by making a set of colorful balls that can be used in the dryer or for decoration. Participants will receive enough materials needed to make three medium sized balls. The number of felt balls you make depends on the amount of wool you use for each one. Bigger ball equals more wool, smaller ones less. These multi-use balls will look beautiful in a bowl or glass vase or can be used in your dryer to speed up drying time and reduce chemicals in your laundry. They make great cat toys and can also be used for hand exercises. Extra wool will be available for sale if you want to make extras. Turn a simple image that you have found, or have drawn, into a stamp that you can use to print on paper. 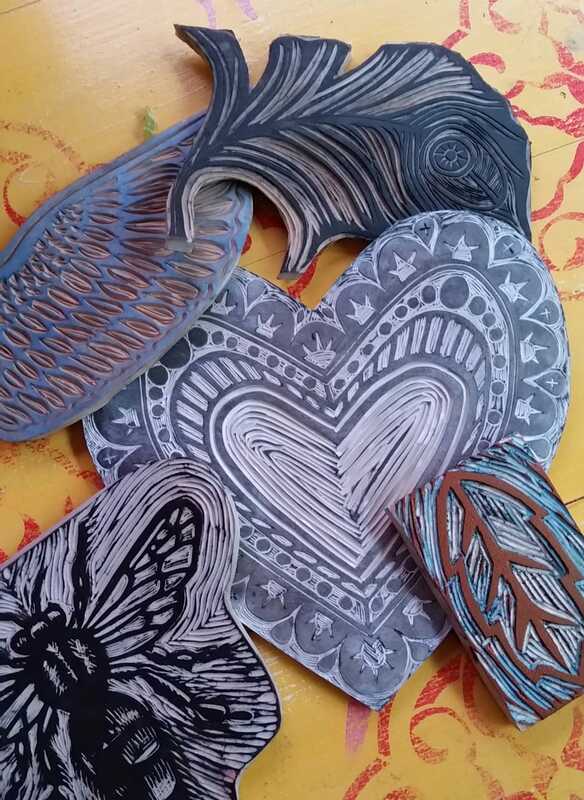 You will learn how to transfer a drawing onto a block, carve it out, and apply ink with a brayer to print it on paper! Instructor will provide stamp block to carve into, ink, some paper and brayers and carving knife students may bring special papers to print on. Do you like to write? Are you someone who notices details most others don’t? Are you between the ages of 8 and 13? SHAMc is starting a newspaper, written and run by kids. Tell Me Something Good will be distributed throughout the city this spring and we want your unique perspective. Local author and editor Laura Kepner will help you discover a great story, organize your key topics, help you with interviewing techniques and much more. The newspaper will also include poetry, photography, essays and short stories as well as interviews and timely news articles. February ~ Meet Frida Kahlo/ Self Portraits - Exploring the life of Frida Kahlo through history, drawing, and mixed media. March ~ Sketch Picasso/ Abstract Art - Students learn different styles of art while learning about Pablo Picasso. We will study the colorwheel, shapes, and abstract art through different mediums. April ~ Earth Day/ Recycle Month - We will be using recycled materials to make 3 diminsional art and saving the earth at the same time. May~ Clay/Pottery - Students will hand build making tiles, pinch pots, and coil pots. We’re going to get messy so wear your worst clothes. By practicing yoga with our children, we learn together the art of relaxation, mindfulness, flexibility, and bonding. We will use a combination of yoga-play, dancing and movement, meditation, and active postures to strengthen the body and release negativity. Baby-wearing is always an option. Class is only ten dollars per family. All ages are always welcome! Capture the essence of nature on paper silk and other fabrics. 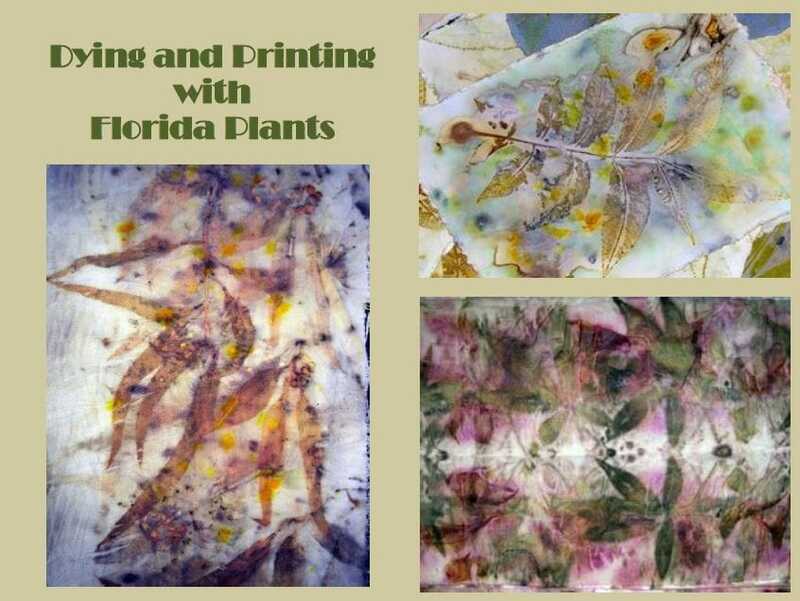 In this workshop you will learn how to extract dyes and prints from the plants in your own yard or natural Florida landscapes. At the end of this workshop, you will take home fabric swatches to use for future reference, a beautifully printed and dyed silk scarf, and several sheets of printed art paper suitable for framing, bookmaking or to use as special note cards. The instructor will share a wealth of information based on her extensive study and experimentation with local plants as dye sources, and provide you with a list of plants that have given her the best results. You will also learn how to determine for yourself, which plant species will render lasting colors, and how to prepare and mordant fabrics. You will leave with enough information to get you started in the fascinating craft of natural dying and printing. Fee includes all supplies, silk samples, paper, and one large silk scarf blank. The instructor will have additional silk scarves available for purchase so students may make more scarves if time permits. Learn how to create your own craft brew in this two-hour workshop. We’ll cover the history of beer making, as well as the basics of fermentation and how to get your own brew started. Join us as we discover unusual wines and pair them with unique hors d’oeuvres. Wine expert Robert Sprentall will facilitate this fun, educational, and delicious event! Ages 21 and older only. Show your support of SHAMc by joining us for this three-course meal, served family style. Beer and wine will be available for purchase to those 21 and older. We'll be announcing 2017 summer camps soon - stay tuned!